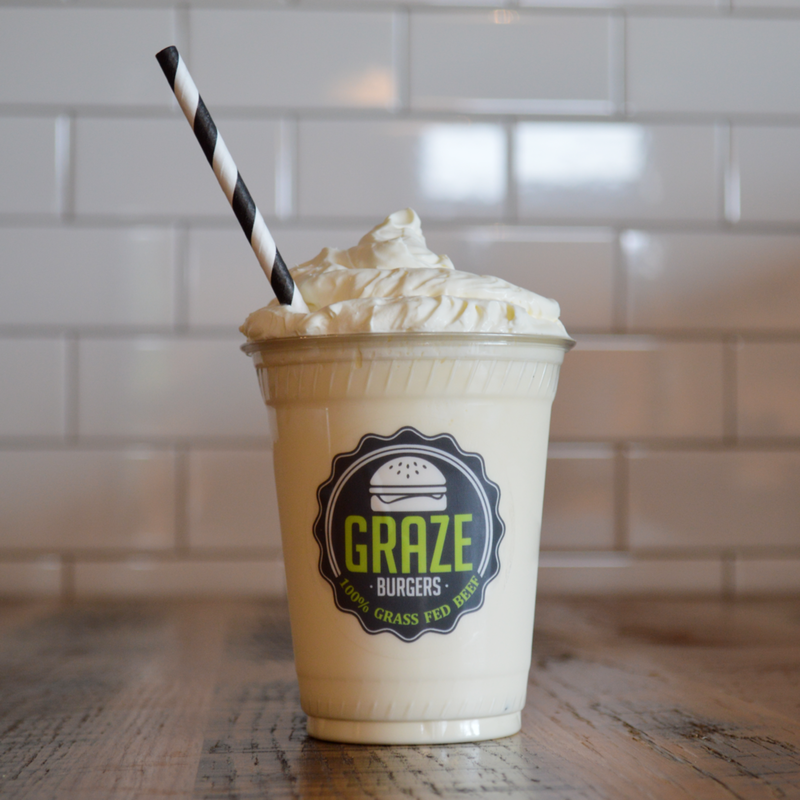 Graze Burgers aims to delight our customers with farm fresh 100% grass-fed burgers, premium fries and shakes, in a socially responsible manner. All our beef is 100% grass fed, hormone-free from our farm in Stonington, CT or one of our local partner farms. Our cattle receive a forage diet for their entire lives. Cattle with smaller body frames produce the best grass-fed beef. Our beef is single-sourced from an animal selected by us. Our burgers are both lean and flavorful because we blend all cuts of meat including prime cuts like the tenderloin, sirloin, ribeye, etc. our shakes bring all the boys to the yard. Fresh Pennsylvania custard contains 10% butterfat and 1.4% egg yolks, creating a rich flavor complemented by a consistently creamy texture. Our flavorings are organic and contain no artificial flavors, colors, sweeteners or preservatives. get some fries with that shake. Carefully selected Idaho potatoes, cleaned and hand-cut into a salt bath on premises, poached, refrigerated, and fried in beef tallow for a delicious crispy outside and billowy soft inside. Beef tallow creates tastier, healthier fries than conventional vegetable oils. Our house-crafted dipping sauces are uniquely made to accompany our french fries - buttermilk herb aioli, smoky barbecue, honey-mustard, sriracha aioli, and our special Graze sauce. 100% grass-fed beef contains 3x more CLA (conjugated linoleic acid) than grain-fed beef. CLA has been shown to be a potent cancer fighter and is thought to limit weight gain, build muscle, and reduce risk of heart disease. 100% grass-fed beef contains more heart-healthy omega 3s, antioxidants such as vitamin E, and lower amounts of LDL cholesterol. Our sandwiches are made with Bell & Evans fresh chicken breasts - never any antibiotics. Impossible Burgers have the taste and aroma of meat but are made from wheat protein, soy, and yeast extract. The secret ingredient is heme which is derived from plants using fermentation - heme makes the Impossible Burger a great alternative for meat-lovers. Our Graze Greens are healthy salad bowl options, made fresh daily and changing seasonally.